Few industries are as exposed to risk as the pharmaceuticals and life sciences sector. Patient safety, clinical trial management, ethics, mergers and acquisitions, research and development and pricing structures are all areas where compliance failings could lead to catastrophic damage to reputation, financial loss and regulatory enforcement action. Clearly globalisation and access to new markets has meant that companies in the sector now risk exposure to bribery and corruption. It is in this area – anti-bribery and corruption in the pharmaceuticals and life sciences industry – where regulatory scrutiny and enforcement action has increased rapidly as regulators expose supply chain and business development risks within companies' overseas operations. growth when moving into new and developing markets. It is no longer enough to carry out basic checks alone on third-parties. Companies must engage in enhanced due diligence if they are to avoid the large fines and regulatory penalties. To help organisations in the sector meet the challenge of enhanced third-party due diligence, LexisNexis has created an ebook 'Something Missing? 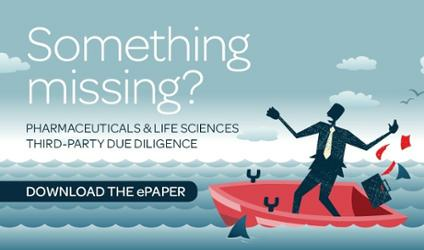 Pharmaceutical & Life Sciences Third-Party Due Diligence'. The ebook can be downloaded at the link below. Keep up to speed on developing news and expert opinion with our regular posts on Anti-Bribery & Corruption; subscribe to our blog to have updates delivered directly to your inbox.